Countries face huge technical challenge in the accurate measurement of greenhouse gas emissions. BOGOR, Indonesia (5 October, 2012)_Policy makers seeking to reduce greenhouse gases from deforestation cannot ignore the levels of nitrous oxide and methane released into the atmosphere as part of land conversion for palm oil, soya bean and other crops, scientists say. While these forgotten gases account for only a small fraction of total greenhouse gas emissions from deforestation, nitrous oxide is up to 300 times more effective at trapping heat in the atmosphere when compared to carbon dioxide over a 100-year time period. Methane is 25 times more effective, says Kristell Hergoualc’h, a scientist with the Center for International Forestry Research (CIFOR). As such, they need to start being a bigger part of the climate change debate. Forest degradation and conversion are responsible for around 12 percent of overall greenhouse gas emissions – the majority of which is carbon dioxide released from forest fires and deforestation. Deforestation itself is not a major contributor to nitrogen and methane gas emissions, however conversion to make way for crops and livestock (an average cow is thought to emit 600 litres of methane per day through belching and exhalation), and the use of nitrogen-based fertilisers to boost agricultural yields is increasing atmospheric levels of these two gases. Peatlands and mangroves are well known for their huge carbon-storing potential – mangrove soils alone store up to 4 times more carbon than trees – however, less is known about methane and nitrous oxide emissions, which may be important for their global warming potential, warns Hergoualc’h. “We need to know the extent to which land-use change contributes to global warming, as this is likely to accelerate in the future,” she said. The accurate monitoring and reporting of carbon dioxide and other greenhouse gases is essential for countries participating in climate mitigation schemes, such as reduced emissions from deforestation and degradation (REDD+) – a scheme that pays developing countries for the carbon stored in trees and soils. “For REDD+ to be successful, you need to prove that you are having an impact and that means being able to quantify the transfer of carbon and other greenhouse gases from the ecosystem to the atmosphere,” said Lou Verchot, CIFOR’s leading scientist on the Global Comparative Study on REDD+. One of the goals of the four-year study is helping developing countries to develop robust monitoring, reporting and verifying (MRV) systems in order to accurately measure their effectiveness in reducing greenhouse gas emissions. This is a huge technical challenge, says Verchot, especially for countries that lack historical data and the technology to monitor their rates of deforestation, forest degradation and carbon stocks. In Indonesia, 60 percent of national greenhouse gas emissions come from land-use change, in part, fuelled by the growing demand for palm oil and agricultural crops. 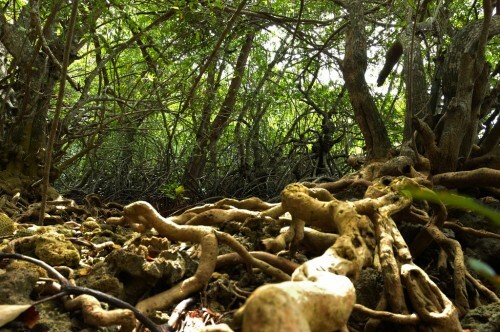 Over 60% of mangroves and 45% of peat lands have already disappeared to meet these demands. At the same time, fertilisers used to boost yields of palm oil plants in converted landscapes, such as Sumatra, are causing significant nitrous oxide emissions. “When the peat is cleared, the natural nitrogen found in the soil is not available for plants, so to ensure that the young oil palms thrive, intensive fertiliser is added during the first three to four years of the plantation. When fertiliser is added it stimulates microbes in the soil that convert nitrogen to nitrous oxide” explains Hergoualc’h. “We need to find ways to reduce these emissions caused by fertilisation without reducing the productivity of the system,” she added. Further research is also needed to understand how climate change mitigation activities might be contributing to greenhouse gas emissions, especially when considering biofuel production. For example, a previous study shows that biofuels may actually be having a negative impact on the environment. It warns that biodiesel crops (such as Jatropha and soy) that require intensive nitrogen fertilisation could “contribute as much or more to global warming by nitrous oxide emissions than cooling by fossil fuel savings”. Similarly CIFOR research suggests that the rewetting of drained peat – a measure to prevent carbon emissions released from forest fires and peat degradation- could increase levels of methane from the soil. Overall the potential methane emission increases would likely be offset by carbon dioxide emission reductions but much more research is needed to quantify these amounts. Policymakers will need take into account the full impact of land-use changes to “assess their true impact” on the atmosphere, argues Verchot. Would we expect to see these emissions and emission rates change for different peat lands in different parts of the world? eg. permfrost areas? Boreal tree regions?